Deep down below the inches of meat (and skin and yes, in most of us, fat) that make up the junk in your trunk lies a small, pesky, pyramid shaped shaped muscle called piriformis. It’s not a glamorous muscle- you won’t find anyone flexing it in front of a mirror- but it’s pretty important. So, before we get mad at it for causing us pain or limited range of motion, let’s understand where it’s coming from: this muscle has a lot of jobs! Piriformis: What is your deal? Piriformis attaches on the front of your sacrum (the triangular bone at the base of your spine) and spans out horizontally to attach at the top of your femur, at the greater trochanter. When it contracts, it externally rotates your thigh. Ready? Stand up and turn your foot out 45-90 degrees. Feel that in your hip? Now let’s think about how often we have our foot rotated out, even slightly: pressing the gas pedal in your car, kicking a soccer ball, sitting with your ankles crossed, running around a track, doing the (real) Harlem shake… also, just sitting on it all day (especially if you tend to sit shifted to one side). And then, to add to it’s list of jobs, the piriformis also holds on to your pelvis to make sure you aren’t flopping around when you walk. This is a delicate job- too much contraction and you’ll turn around in circles, and too little will give you a serious shimmy. This stabilization also allows us to balance, so give it a nod next time you rock your tree pose. When the piriformis is feeling overworked and overloaded, you might notice a literal pain in the rear. Did you not go to see Les Misarables because the idea of sitting in a theater for 3 hours sounded too uncomfortable? Are you not too happy about going for long walks or a run because it causes pain, or do you have vague pain anywhere from your low back to down the back of your leg? Could be piriformis. And then there’s the whole thing about how the sciatic nerve passes right underneath piriformis, which can lead to compression of the sciatic nerve (sciatica). WHAT. Let’s do a quick check: lie on your back. Do your feet naturally flop out to the sides? Flip over and bend your knees- do your feet not want to flop out to the sides? Yup- you’ve got a tight piriformis. Once you’ve identified that your piriformis needs to check itself, you have a few options to give it a break. 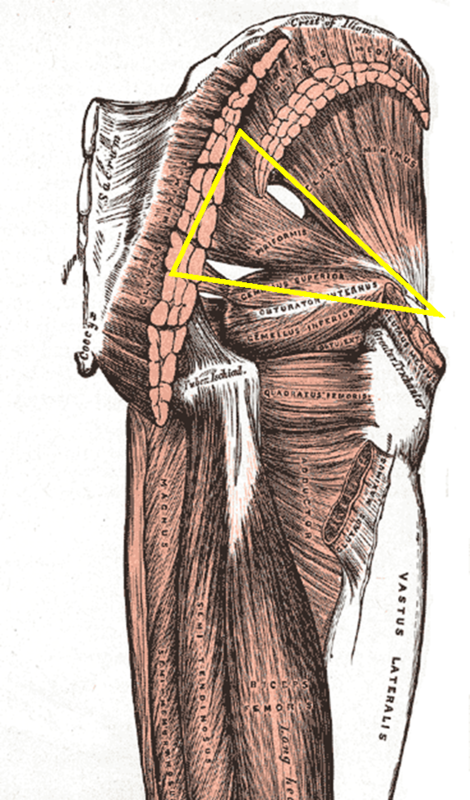 In order to access this deep muscle, you need to get through the thick tissue above it (gluteus maximus). To make this easy on you, put the glute in a shortened position by either laying flat or standing, and perform self massage with a tennis ball. Therapists: put your client into a prone “frog” position to really get in there. Positional release techniques work great to allow it to “breathe”; you can also get really specific by lining up your fingertips or knuckles horizontally in the space between the sacrum and greater trochanter, and sink in to the tissue- bending the knee allows you to internally and externally rotate the femur, which will let you identify the exact location of the muscle, and scrub the tissue further. After you’ve relieved some trigger points and have talked some sense into it, give piriformis a stretch. Lying on your back, put your foot down over the opposite (straight) knee, and gently twist into the mid-line. You could also hook a towel over the foot on the side you want to stretch and pull it over the mid-line. If you’re a yoga fan, pigeon pose is a deep stretch for your piriformis- go easy if it’s grumpy! Do you have any tricks or tips for working piriformis? Comment below! Jess is a licensed massage therapist, not a doctor. Please use this advice responsibly, and seek medical attention if you feel you have a serious problem.